Are There Too Many Tea Books? The avalanche of tea books seems neverending, with many of them highlighted on this blog by my fellow blogger Bill Lengeman (his latest: Recent and Upcoming Tea Books 17). At some point my mind starts to overheat, the gears start to go “Screeeeee!” and I call out “Enough!” The next words out of my mouth are usually “Are there too many tea books?” As usual, it depends. “Too many” usually means there is far more than is needed to meet a specific requirement. In my early days of writing about tea, my Harney & Sons tea book was a must, but a horde of books on tea would have been repetitive and overwhelming. This book covers basics and helps those just starting to learn about tea. Another book called simply Tea was also a great intro. And it has lots more large, gorgeous photos. Ah! The visually oriented part of my brain was made very happy. Sooner or later, tea drinkers find that they want to focus on certain types of tea. In my case, I am shifting more towards an Asian experience (it’s about 20% of my tea drinking right now) and so wanted to focus my reading more in that direction. So, when I had the chance to receive a review copy of a book about tea in China, I said “Sure!” So, my tea library grew when The China Tea Book arrived. Great info and more gorgeous photos. The perfect book to peruse during my Afternoon Oolong session. In between the books named above, other tea books came my way, some fiction, some more factual, and some a total jumble. Some were fun reads, others bored me to tears. But I digress. The question still remains about there being “too many” tea books. Sorry, that’s for another article! Fresh-Brewed Iced Tea from a Convenience Store? please, would you tell us :who is the author of the “China Tea Book”? and also when and where as it published ? the three views look very tempting. I hadn’t meant to promote any one book but tea books in general. However, the author is Luo Jialin. Published in Nov. 2012 by Earth Aware Publications. 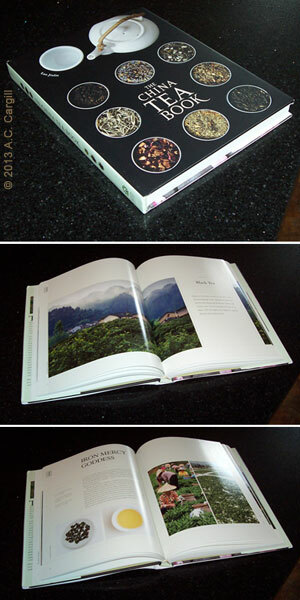 Here’s one place to buy it: http://www.jas-etea.com/the-china-tea-book/ There are probably others. Happy reading!